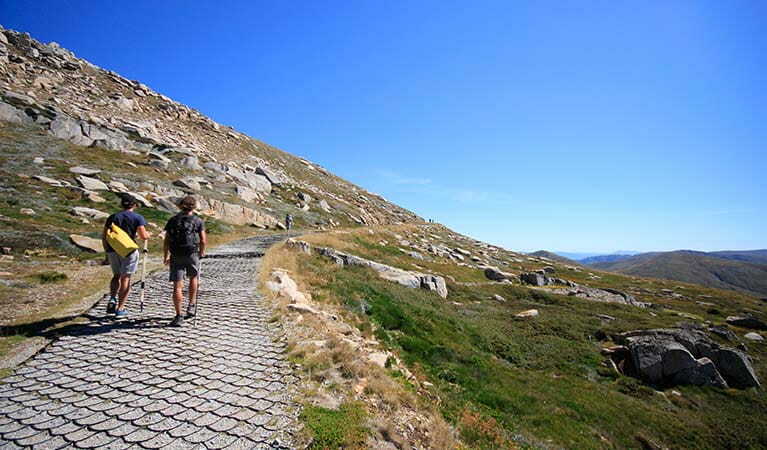 This iconic day walk from Thredbo will have you conquering the summit of Mount Kosciuszko in a couple of hours. You'll quite literally be on a high as you soak in the epic views from Australia's highest point. The track is generally snowbound in winter (June to October). You can get to Mount Kosciuszko on cross-country skis or snowshoes, but there are no snow poles marking the route. The track starts at the top of the Kosciuszko Express Chairlift, which runs 9am - 4.30pm and takes 15mins. For chairlift prices visit the Thredbo website. 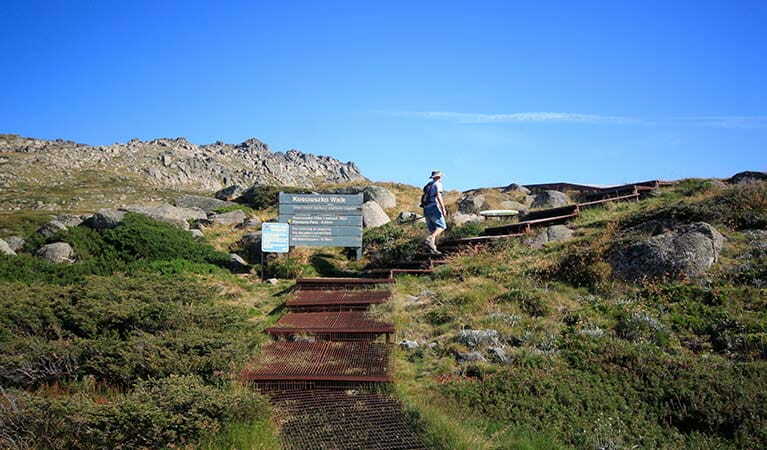 You can also walk up Merritts Nature Track from Thredbo Village to the top of the chairlift. This difficult 4km track takes around 2-3 hours uphill. It's a good idea to bring a topographic map, compass, and a GPS, and read our safety tips before you set out. Fill in the free trip intention form and hire a PLB from the Snowy Region Visitor Centre. 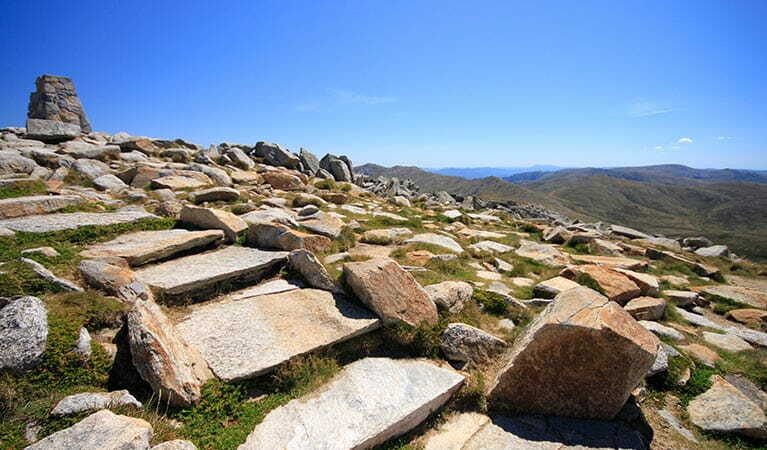 If you’re visiting Kosciuszko National Park in the warmer months, a walk to the summit of Mount Kosciuszko is a must-do. Starting at the top of the Kosciuszko Express chairlift at Thredbo, this popular day walk takes you to the rooftop of Australia. After the scenic chairlift ride, you'll travel past the rocky granite outcrops of Ramshead Range, and through alpine wildflowers (spring). Stop at the lookout for views of the country's highest mountain. 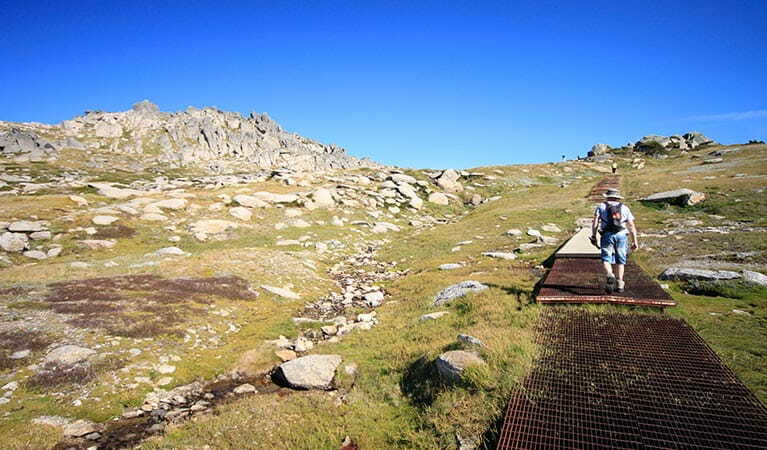 The track crosses the headwaters of the Snowy River, before climbing above Lake Cootapatamba and on to Rawson Pass. From here, it’s a gradual climb to the summit of Mount Kosciuszko (2228m). The sweeping 3600 views across the Snowy Mountains and Victorian High Country are sure to wow you. Stay a while to soak in the fresh alpine air, pack a summit snack, and wallow in your sense of achievement, before returning along the track to Thredbo. 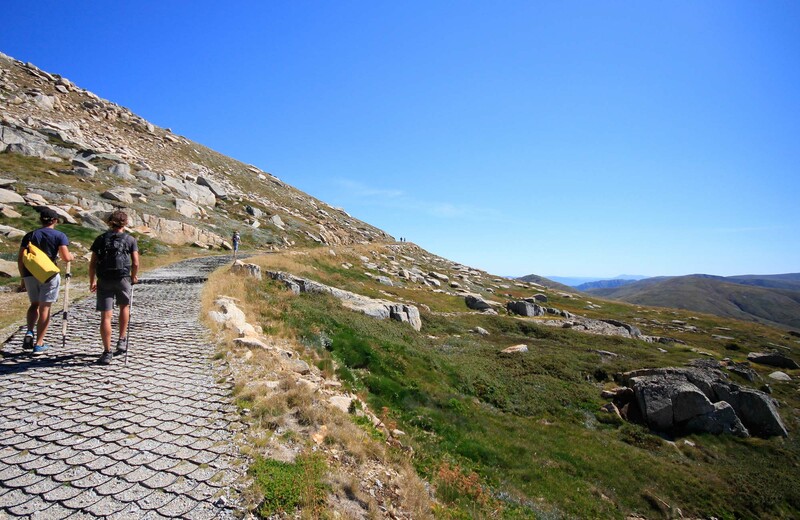 Take a virtual tour of Kosciuszko walk - Thredbo to Mount Kosciuszko captured with Google Street View Trekker. If you’re craving adventure but your annual leave balance won’t let you leave the country, head to Kosciuszko National Park for a weekend away with friends. You’ll get all the heart-thumping action, with none of the jet lag. 8.30am to 5pm daily. Closed Christmas Day. The Thredbo-Perisher area is open all year, but some roads and trails may close due to weather conditions or park management issues. Kosciuszko Road is closed between Perisher and Charlotte Pass in winter (June to October long weekends). Winter (June to October long weekends): $29 per vehicle per day (24hrs from purchase); motorcycles $12; bus passengers $11.45 per adult, $3.60 per child per day. Find out more about the winter entry surcharge. Rest of Year: $17 per vehicle per day (24hrs); motorcycles $7; bus passengers $6.60 per adult, $2.20 per child per day. Passes: Day passes, multi-day passes and annual All Parks Pass available from NPWS visitor centres, local agents and operating vehicle entry stations. Read our Annual Pass FAQs for information. Short Breaks Pass: $68 for 5 days park entry at price of 4 days (not valid winter). Eligible pensioners can apply for a complementary NPWS concession pass, to get free park entry. Download the exemption form (154KB doc). Contact hours: 8.30am to 5pm daily. Closed Christmas Day. Contact hours: Winter: Monday to Friday, 8am to 4pm. Saturday and Sunday, 8am to 12pm and 1pm to 4pm. Summer: Monday to Friday, 8am to 12pm and 1pm to 4pm. Closed Saturday and Sunday.